An Israeli military bulldozer accompanied by a military jeep closed the road connecting Khirbat Al-Karmel with Wadi Al-Jawaya, southeast of Yatta in the Hebron governorate, on Sunday afternoon. Mariam Abu 'Aram, a board member of the Al-Jawaya Charitable Society, reported that an Israeli bulldozer closed the only road to Wadi Aj-Jawaya, where about 30 Palestinian families live, and other villages like Masafer Yatta and At-Tuwani, which has some 300 residents. Over the last few years, Israeli authorities have frequently closed the roads and pathways leading to these villages that cross Road 60, a settler bypass road that connects Israeli settlements in the area. The south Hebron hills area suffers from ongoing Israeli measures including forbidding construction and demolishing houses, confiscating cattle and property, as well as physical attacks on Palestinian civilians by Israeli settlers. The Israeli human rights organisation B'Tselem recently distributed a video showing drunken settlers in the area attacking Palestinian shepherds with bars. The Israeli army invaded a small protest camp near the village of Qaffin early Sunday morning. Forces detained the 13 year old son of Qaffin Mayor Sa'id Arashid, saying they would release the boy only if the Mayor agreed to close down the camp. The International Solidarity Movement (ISM) reported that at 3am, 30 Israeli soldiers attacked the camp, which is was set up at the beginning of June, 200 meters away from the Israeli separation wall. Forces detained one boy: the son of the town's Mayor, and threatened him with arrest. According to the Mayor, soldiers have declared the area a "closed military zone," though no papers to that effect have been produced. The Mayor was later informed that his son would be released as soon as the camp was closed. The camp was initially set up in opposition to the illegal separation wall that prevents many Qaffin farmers from reaching their land. The area was recently designated as a site for a children's summer camp. Thirteen Palestinian, Israeli and international demonstrators were injured when Israeli soldiers violently repressed a peaceful a demonstration against the construction of Israel's illegal separation wall in the West Bank village of Ni'lin, west of the city of Ramallah. Dozens of others suffered from various degrees of suffocation as they inhaled tear gas. According to Salih Al-Khawaja, coordinator of the Popular Committee against the separation wall in Ni'lin, "The Committee invited residents, farmers as well as foreign and Israeli solidarity activists to a peaceful rally which started from the village's center. Meanwhile, Israeli forces gathered in an unprecedented way, doubling the numbers of bulldozers and military vehicles." He added that before the rally reached the planned location of the wall, where Israeli construction vehicles are already working, Israeli troops brutally attacked the protestors, hitting them with clubs and rifle butts. Palestinian farmer Ahmad Rashida was beaten by Israeli troops in front of his eight-year-old daughter. Furthermore, Ibrahim Fahmi was shot in the hand. The soldiers broke the leg of an Israeli peace activist named Jonathan. The wounded were evacuated to Sheikh Zayid Hospital in Ramallah for treatment. The residents of Nil'in and their supporters have been protesting the construction of the Israeli wall every week for over a month. Organizers say that over 150 people have been injured as a result of the Israeli military's repression of these demonstrations. Residents of the northern West Bank town of Tubas buried 18-year-old Muhammad Nasser Sa'id Daraghmah on Sunday afternoon. 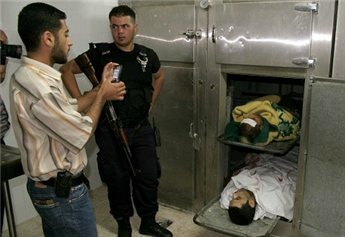 Daraghmah was shot dead by Israeli troops 2am on Sunday morning. 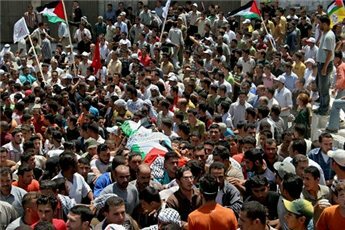 Those who attended the funeral shouted slogans condemning the killing and calling for Palestinian unity in the face of the ongoing Israeli occupation. Opening fire on stone-throwing teenagers, Israeli troops shot Daraghmah eight times, witnesses said. Another unidentified young man was arrested by the Israeli forces. Palestinian medical sources said that Daraghmah died immediately. Witnesses added that Israeli troops shot Daraghmah at close range, appearing to kill him deliberately, instead of arresting him or shooting him in his lower body. Daraghmah was arrested two years ago and served more than a year in Israeli jails. He was affiliated with the Fatah movement. Israeli forces have now killed four Palestinians in the West Bank within a week. On Friday night, Israeli troops shot and killed a Palestinian teenager in the southern West Bank town of Beit Ummar, north of the city of Hebron. Last Tuesday, Israeli troops gunned down a Palestinian fighter and an unarmed student in the city of Nablus. Farmers in the village of Artah, west of Tulkarem, reported on Saturday that they had lost their harvest because of a substance that Israeli forces sprayed on their crops earlier this month. 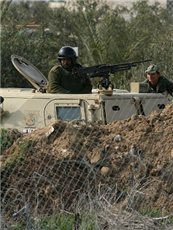 According to the farmers, a tractor accompanied by an Israeli military jeep sprayed a poisonous substance called "Alber super" on crops planted near the separation wall in Artah on 11 June 2008. The farmers reported huge agricultural losses, and indicated that they need assistance from the Ministry of Agriculture and relevant institutions. On Saturday, the Social Work Committees (SWC) visited the farmers and the affected agricultural areas, which are near the Jashouri factories next to the separation wall west of Artah. 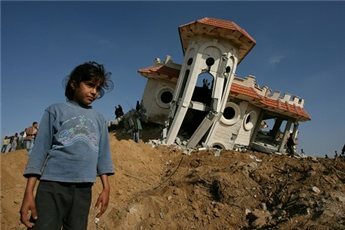 The SWC human rights committee noted that such Israeli destruction of Palestinian crops violates international humanitarian law, specifically the Fourth Geneva Convention, which stipulates that an occupying power must protect civilian property, the population and the land during times of conflict. The committee stressed that they will respond to this crisis and inform the relevant legal institutions about the Israeli practices, especially since the affected land is surrounded by the Israeli wall and toxic chemical plants that have negative effects on people and the environment in general. 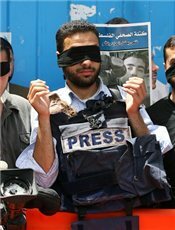 The Palestinian Journalists' Bloc issued harsh statements Saturday against the cruel treatment by Israeli soldiers of Gaza journalist Mohamad al-Mughier. Al-Mughier lives in the Rafah refugee camp in the southern Gaza Strip, and was attacked while on his through the Allenby Bridge. The Bloc said in a statement to Ma'an that "al-Mughier was brutally interrogated and beaten by Israeli soldiers while entering the West Bank on his way home from Britain, where he received the 'Martha Gelhorn Journalism Prize' for 2008." Al-Mughier was being recognized in the United Kingdom for his collection of stories published in the Washington Report for Middle East Affairs. The Bloc affirmed its solidarity with al-Mughier whose work marks a new high for the "accomplishments of Palestinian journalists on the world stage." They called for international organizations concerned in the freedom of Journalists to "intervene and to help work on curbing Israeli violations of the freedom of media work in Palestine." Two international solidarity activists were injured by Israeli forces on Friday in the weekly protest against the separation wall in Bil'in, west of Ramallah, and dozens of protesters were treated for tear gas inhalation. Villagers from Bil'in marched together with international and Israeli solidarity activists after Friday prayers, carrying Palestinian flags and banners demanding the removal of the Israeli wall and settlements and calling on the international community to lift the siege on Gaza and help Palestinians retain Jerusalem. Participants also demanded that the Israeli army stop killing Palestinian civilians and end the use of live ammunition against non-violent protesters. As they approached the separation wall, Israeli forces prevented the villagers from reaching the gate that is supposed to provide access to their lands, and opened fire on them with tear gas canisters, sound bombs, and rubber-coated metal bullets. Scores of protesters were treated for gas inhalation, and Sean Burg, from the US, and Sean McCurry, from Ireland, were injured by rubber-coated metal bullets. In addition, on Thursday evening Israeli settlers raided a house built three years ago by the Bil'in Popular Committee for Resisting the Wall on the village's land near the Matityahu East settlement. The settlers burned part of the house, which was built by the Popular Committee to help villagers maintain access to their lands and olive trees on the other side of the wall, and stole equipment from it. For the past month the Israeli army has prohibited the villagers from staying overnight in house, making it even harder for the villagers to protect their trees and equipment from settler attacks. Also on Thursday, the Israeli army released Bil'in resident and activist Tariq Muhammad Taufiq Al-Khatib after detaining him for one week for his participation in the weekly protests. Villagers in Bil'in have been demonstrating every week against the separation wall for the last three years. Despite the 2004 International Court of Justice ruling that Israel's construction of the wall inside the occupied West Bank was illegal, and a November 2007 Israeli High Court of Justice ruling ordering the military to re-route the wall in Bil'in, the villagers continue to be denied access to the land on which their livelihoods are based. Israeli forces disrupted the funeral of 17-year-old Muhammad Anwar 'Alami in the village of Beit Ummar, north of Hebron, on Saturday afternoon, firing tear gas and rubber bullets at mourners. 'Alami died on Friday evening after he was shot in the heart by Israeli soldiers in the village. A number of citizens from Beit Ummar were treated for tear gas inhalation, while others were lightly injured by rubber-coated metal bullets fired by Israeli soldiers at mourners who had come to bury 'Alami in the village cemetery. The cemetery is located next to Road 60, a settler bypass road which bisects the village, and near the Israeli military tower at the main entrance to the village. Local sources told Ma'an that the townspeople tried to avoid any interaction with the Israeli troops stationed at the entrance of the village, but this proved impossible when Israeli soldiers provoked a number of mourners in the funeral procession, and some of the youth reacted by throwing stones at the soldiers. Israeli troops fired tear gas and rubber-coated metal bullets at the crowd of mourners, leading to a number of minor injuries. Several journalists present at the funeral procession and burial reported that Israeli soldiers attacked them as they were trying to film and cover the events. Palestinian medical and security sources had earlier reported to Ma'an that Muhammad Anwar 'Alami was killed by Israeli forces late on Friday evening, during clashes that erupted between Palestinian youth and Israeli forces stationed in the village. The sources added that the clashes continued in different parts of the village during Friday night, as Israeli forces entered the village and searched more than twenty homes. During these searches, Israeli troops abducted nine civilians from their homes. Among those arrested were: 28-year-old Muhammad Ahmad 'Abd Al-Majeed Ikhlayel, 22-year-old Omar Issa 'Abd Al-Qader Zakrawi, 18-year-old Amin Samir 'Abd Ar-Rahman Abu 'Aisha, and Muhammad Mahmoud Abu 'Ayyash. About 21 protesters were injured by rubber-coated metal bullets and tear gas fired by Israeli forces during a peaceful protest march against the separation wall in Ni'lin, west of Ramallah, on Thursday. Despite the violent response of the Israeli forces, participants were able to reach the Israeli bulldozers and stop them from working during the protest. The regular marches and sit-ins organised by Ni'lin residents have managed to slow the destruction of the village's agricultural land. So far, the bulldozers have razed 1,200 meters of the wall construction site in the village, but they are behind schedule. The Israeli company has recently brought in three additional bulldozers in an effort to speed up the work. During the protest, Israeli troops severely beat Majdi Salah 'Amira, who stood on top of a bulldozer to prevent it from working, and Rizk Dabbous, who lay on the ground in front of a bulldozer. 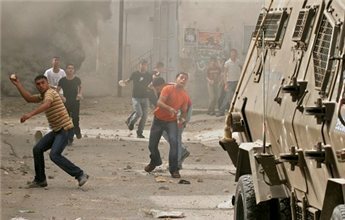 Clashes continued until late Thursday afternoon, and Israeli forces stormed houses in Ni'lin and fired sound and gas bombs. The separation wall will result in the de facto annexation of 2,500 dunams of land belonging to Nil'in residents once it is fully built. Together with four neighboring villages, Nil'in will be isolated from the rest of the West Bank by the wall and an expanding system of Israeli settlements, checkpoints and roadblocks. Settlers ransacked seven dunums (seven thousand square meters) of land planted with tomatoes and beans in Wadi Az-Zarqa'ib, near the village of Beitillu on Sunday night. The perpetrators are thought to be from the Hallamish settlement, built on the lands of An-Nabi Saleh. The land was looted while its owner, Abu Ziyadea was away. The greenhouses and the farm storehouse were burned down, along with all the farm equipment and fertilizers. The irrigation system and the water pumps were destroyed, and most of the harvest is unsalvageable, including permanent damage to the original olive trees on the property. Since the harvest was destroyed during the fertile season, agricultural experts have estimated losses at approximately $50,000. This is not the first time Abu Ziyadeh has had problems with the nearby settlement. Wild pigs, he says, are often released by settlers, which wreak havoc on his crops. Abu Ziyadeh sent out an appeal to human rights institutions, the international public and local officials to protect Palestinian farmers from the attacks of wild pigs and Israeli settlers. He also hopes to be compensated for his losses. A Hebron woman was hospitalized on Wednesday evening after she was assaulted by Israeli forces who were trying to detain her brother. Thirty-one-year-old Jawaher Taha was taken to the governmental hospital in Hebron for treatment. Local sources told Ma'an that Israeli forces stormed the Abu Sneineh neighborhood of central Hebron and detained the woman's brother, 19-year-old Ghalib Rajeh Abdul-Mohsen Taha, after forcing the family to leave the house. He had been released from an Israeli jail four months ago. A 15-year-old Palestinian, Raed Walid Omar, was shot in the face, just under the right eye by guards at Israel's Shatta Prison, where he was attempting to visit his detained brother, Omar, on Tuesday. Raed's father Walid Barham said the prison guards prevented his family from entering the prison. When the family protested, the guards opened fire, hitting Raed Walid Omar with five rubber bullets. The family is from the town of Kafr Qaddum, near the northern West Bank city of Qalqilia. Recent Israeli operations threaten to demolish seven day old truce. Israeli forces shot 80-year-old farmer Salem Abu Reideh just east of Khan Younis on Wednesday morning. Reideh was transferred to hospital and is in serious condition. This injury marks the second shooting of a civilian by Israeli forces during the seven days since the truce agreement was signed between Israel and Hamas. On Monday afternoon - the fifth day of the truce - 67-year-old Jamil Abdel Rahman Al-Ghoul was shot and injured by Israeli forces in the north of the Gaza Strip, while he was in his garden, and was taken to hospital in serious condition. On the first day of the truce, Israeli soldiers shot at fishermen on their boats off-shore in Gaza, and were reported to have shot at civilians near the eastern fence of the Gaza Strip causing the death of one cow owned by a Palestinian farmer. A third man was shot when Israeli forces invaded the West Bank city of Nablus and assassinated a leader of the Al-Quds brigades, the main military wing of Islamic Jihad, on Tuesday. The man died as a result of the injury. These breaches of the Egyptian brokered truce were largely ignored by West Bank and Gaza residents, in the hope of preventing Israel from demolishing the agreement and ending the atrocities in Gaza. Despite efforts, Gazans continue to wait for the end of the blockade. In response to the Nablus assassination, however, the brigades launched a number of projectiles at Sderot. In answer to the incident, Israeli Defense minister Ehud Barak ordered the closing of all crossings into the Gaza Strip. This will further stifle the flow of necessary goods being shipped into the markets of the Gaza Strip. Throughout the year long blockade Gazans have been deprived of most essential living supplies. According to sources in the general administration of crossings in the Gaza Strip, Israel had committed to a 30% increase in goods shipped into the area. According to this agreement, the tenth day of the truce would see an additional increase in the stream of supplies entering Gaza. The same sources said that by Tuesday evening, 72.5 truckloads of goods had been allowed to pass through the crossings. At Karni crossing, Israeli troops were only letting in loads of grain and fodder, while the Kerem Shalom crossing has remained closed throughout the seven days of the truce. Despite discontent, PFLP says "it is too early to end this agreement"
A 9-year-old child was injured by Israeli gunfire during a peaceful protest against the separation wall and house demolitions in Far'un, south of the West Bank city of Tulkarem on Tuesday afternoon. Mohammad Abdel Kareem Salim Bdeir was shot with a rubber bullet in the foot while participating in the protest. The protestors say the construction of the illegal Israeli separation wall has appropriated thousands of dunums of agricultural lands in the village. Protestors also demonstrated in front of houses under threat of demolition. National factions, members of the International Solidarity Movement and local residents of the village raised the Palestinian flag and banners against settlements and the separation wall. They called on the United Nations, the international community, the Arab league and the Islamic conference organization to move towards ending such Israeli practices and force Israel to abide by international law. The Israeli authorities have recently issued a demolition order against two more houses in the village bringing the total number of houses under threat to ten. Israeli forces stormed Arraba at one o'clock Tuesday morning, roaming the streets then moving on to Kafr Ra'i and Fahma. Forces also moved into Silat al Harithiya, where more than seven military vehicles were seen, and then to Jenin, where locals reported three military vehicles at about three o'clock in the morning. During the raid forces used sound bombs to gain access to the homes of Tha'er Mohammad Jaradat and his cousin 'Asem Mohammed Jaradat from Silat Al-Harthiyah, who were then detained. Several other homes were invaded. There were no arrests in Jenin, though gunfire was heard, according to local sources. Hundreds of Palestinian farmers and foreign supporters participated in a massive march against the wall on Tuesday in Ni'lin. 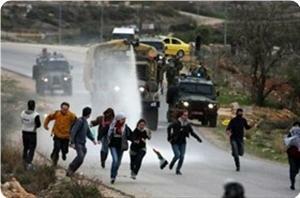 The marchers clashed with Israeli forces on their way to the west of Ramallah, despite efforts to avoid troops. The coordinator of the movement against the wall in Ni'lin, Salah Akhawajl, said that there were last minute changes to the planned route of the march, in order to try to avoid the Israeli troops. The protesters split into two groups, each taking a different route to Ramallah to avoid troops stationed on the planned protest route. He added that Israeli military bulldozers pulled out but Israeli troops clashed with the demonstrators. The Israeli army assassinated a Palestinians student from An-Najah University and a prominent leader of the Al-Quds Brigades in Nablus early on Tuesday morning. Israeli special forces raided the students' second floor building in the Al-Sal'ous neighborhood in the Al-Makhfiyeh area of western Nablus and shot dead 24-year-old Iyad Khanfar, a fourth-year student at An-Najah and 23-year-old Tariq Juma'a Abu Ghali, one of the most prominent Al-Quds Bridages commanders in the northern West Bank. He had survived five previous assassination attempts. Five others were also detained for a period of time. Palestinian medical sources told Ma'an's correspondent in Nablus that the dead bodies were transferred to Rafidya Hospital in Nablus after the Israeli army withdrew from the area. Dr. Ghassan Hamdan, director of Medical Relief in Nablus told Ma'an's correspondent that the young men were not armed. 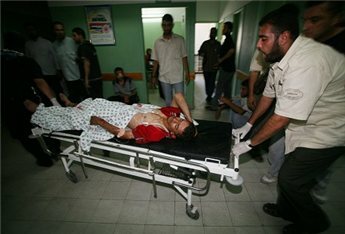 Hamdan added that the Israeli army opened fire at the two youths, riddling their bodies with bullets. One of the men was hiding under the bed and was shot in the head. Eyewitnesses told our correspondent in Nablus that the Israeli Special Forces surrounded the Al-Masri and Al-Sal'ous buildings in the Al-Makhfeyeh area shortly after midnight. Loud explosions and intensive gunfire were heard. Israeli sources said that Tariq Juma'a Abu Ghali was affiliated to Islamic Jihad and he had carried out several operations on Israeli targets, adding that the Israeli forces discovered weapons and ammunition and explosive devices in the house. Islamic Jihad threatened to retaliate against the killing, saying that the truce in the Gaza Strip "does not mean that we will sit and wait for the Israelis to slaughter us one after the other." Dawoud Shihab one of the Islamic Jihad leaders in Gaza said that the assassination will not go unpunished, threatening a response in the coming days. He called on the Palestinian resistance groups in Nablus to take a clear and united stance against Israeli aggression in Nablus, saying "the occupation will not succeed in ending the resistance factions in Gaza and the West Bank especially Islamic Jihad and the Al-Quds brigades." Hamas also called on the Palestinian resistance factions to "confront the occupation crimes" in the West Bank. Hamas spokesman Sami Abu Zuhri called on security agencies in the West Bank to allow the resistance factions to confront the Israeli aggression and called on the international community and to "exert pressure to stop the occupation crimes." "We reaffirm our commitment to the truce and we call on all factions to put pressure on the occupation to stop the crimes. So the problem is not with the resistance factions and the Palestinian people but with the occupiers continued aggression against our people despite the truce agreement," he said. A 67 year-old man was shot and injured by Israeli forces in the north of the Gaza Strip on Monday afternoon. Local sources told Ma'an that Jamil Abdel Rahman Al-Ghoul was shot while he was in his garden which is 350 meters from the eastern border of the Gaza Strip. 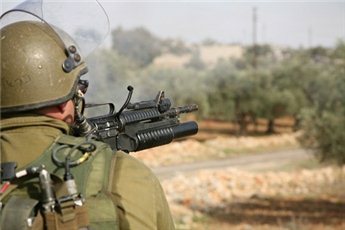 The Israeli army opened fire on, injuring him in the shoulder and neck. One of his relatives, Abu Ziad Al-Ghoul, said that the man was seriously injured and was taken to Kamal Adwan Hospital in the north of the sector. Five Palestinian civilians were injured by Israeli forces during a sit-in protest against land confiscation and the separation wall called by Popular Committee for Resisting the Wall in the village of Nil'in, west of Ramallah, on Sunday. Three were hit by rubber-coated metal bullets, and two were suffocated by tear gas bombs. Salah Al-Khawaja, coordinator of the Popular Committee in Nil'in, described the events: "This morning, Nil'in residents, farmers and foreign solidarity activists headed towards the Israeli bulldozers for a sit-in protest to obstruct the military vehicles and stop them uprooting our olive trees. Israeli forces showered them with gas bombs, which changed the peaceful protest into a confrontation between the Israeli forces and the young men." He added that an Israeli soldier was hit in the head by a stone, and that the bulldozers had been prevented from razing land for two hours. Al-Khawaja explained that this protest was part of a campaign of popular resistance against construction of the separation wall in Nil'in. A large rally at the construction site and the village lands threatened with confiscation is scheduled for Tuesday. He noted that villagers had also marched on Saturday towards the settlement built on their land, and affirmed that such actions express their continuing rejection of illegal Israeli settlements. If completed, Israel's separation wall will result in the de facto confiscation of 2,500 dunams of Nil'in land. Expanding Israeli settlements and other methods of closure, in addition to the wall, will completely separate the villages of of Ni'lin, Mediya, Shukba, Shabteen and Budrus from the rest of the West Bank. Israeli forces seized four Palestinian civilians during an overnight raid in the village of Ourta, south of Nablus on Sunday. Witnesses said that Israeli forces stormed a number of houses, detaining Bara' Qussai Yahya 'Awwad, Majdi Suleiman, Mahmoud Awwad and Nadim Awwad. Israeli forces raided the headquarters of an ambulance service on the Jerusalem-Hebron in the West Bank town of Beit Ummar on Friday night, witnesses said. Nasir Abdul Hamid Al-Alami and Omar Odeh Al-Alami said that, in the same raid, Israeli soldiers pulled them from their homes. Israeli troops then stormed the ambulance center, breaking the main gate and several windows. The head of the Red Crescent Society in Hebron, Abdel Halim Al-Ja'afreh, condemned the attack. Al-Ja'afreh said that equipment damaged in attack is now unusable. With an Israel-Hamas ceasefire in place, an air of normality is beginning to return to the beleaguered towns east and north of the city of Khan Younis, in the southern Gaza Strip. These towns have witnessed some of the worst of Israel's daily incursions and air strikes over the past year. Earlier in June, two eight-year-old girls, Hadeel Al-Sumairi and Aya Hamdan Al-Najjar, were killed in towns near Khan Younis within a week of each other. Hundreds of residents fled their homes as a result of the violence, renting apartments in the city of Khan Younis and elsewhere. Some are now returning to their houses. They are hoping to rebuild homes that were shelled work on land that was overrun by Israeli bulldozers. Yet, residents in areas like Al-Qarara, Khuza'a, Abasan Al-Kbira and Abasan As-Saghira told Ma'an that they needed guarantees that Israeli forces will not invade their towns again. Eighty-year-old Sulaiman Abu Daher owns a farm less than 200 meters from the Kisufim gate, where Israeli tanks and bulldozers enter the Strip. Although his land has been churned up by the bulldozers, Abu Daher made his decision to return home. "We will return home. Why not? Those are our homes and lands," he said. "If we leave them they will be lost." "I only have to have patience for what the occupation did to my land. If [the occupation] returns and bulldozes my land I will work in it again . I have just this one option," he added. Yet even members of Sulaiman's own family do not share this feeling. Sulaiman's son Yousif, said "As for me I will not return. I am ready to pay the rent of a house that is far away to guarantee the safety of my nine children. What is the guarantee if the occupation returns to shoot and kill our children while playing in front of their home same as it did to our neighbor Hadeel As- Seimeri. there no guarantee or trust them [the Israelis] for not doing that." He added "they [the Israelis] seized me twice when they invaded Al-Qarara and arrested my father. When I told them, 'look he is an elderly man,' they said 'let him die.' I will not trust them and will not return." Yousif also claimed that the Israeli army violated the truce on Friday, opening fire on his Father on his way home to the farm, killing one of his sheep. Abdullah Muhana, who lived next door to Abu Daher's family and works as a teacher in Al-Qarara, said, "I returned, leaving my children behind. [They are] waiting a signal from me. .If I feel safe I will bring my family." He added that "the Al-Qarara area was invaded twice. One of the invasions was a wide-range one. My nine-year-old daughter Razan screamed and asked me to leave home. When she started to feel the [recent] calm, she asked me, 'dad when will we return home.'" Commenting about his neighbor's situation, he said, "He has the excuse of not returning. His home is the closest to Kisufim gate. It is true on Friday the Israeli soldiers opened random fire at the residents so that they will not get close to the electronic wall. But we optimistic and we wish to return homes which we left. We hope that this truce in effect will enable us to work in our land that was bulldozed repeatedly by the Israeli army." Of those who returned to their homes in the "Eastern Area" of Khan Younis spent Friday night sitting in front of their homes, relaxing after weeks of being forced in doors at 8pm each night. Umm Ali An-Najjar, widow and a mother of two children, is happy that life is returning to normal to the village of Khaza'a. There, farmers are working the land again. An-Najjar never left the village, saying that she would protect her children with her own body, or hide them under a bed with their toys. The Gaza Strip began a third day of calm on Saturday morning as both Israel and Palestinian resistance groups held fast to an Egyptian-brokered ceasefire. 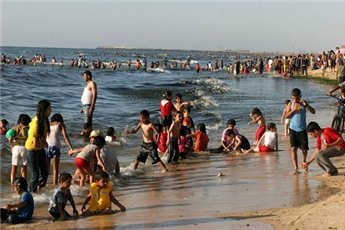 Palestinians in Gaza, meanwhile, are waiting expectantly for Israel to ease its year-old blockade of Gaza's borders. According to the reported terms of the truce, Israel agreed to allow more vital supplies into Gaza after the third or fourth day of calm. Fuel and cooking gas are expected to pass through the Nahal Oz fuel terminal near Gaza City, and commercial goods through the Karni crossing, also near Gaza City. The Sufa crossing, in the southern Gaza Strip, will be opened to allow the shipment of building materials such as iron and cement. The status of the Rafah crossing point between Gaza and Egypt is still to be negotiated. Israel and Hamas agreed to defer the opening of that crossing until after an initial period of calm. The Rafah crossing is formally under Palestinian and Egyptian control, although Israel maintains effective power to open and close the crossing by controlling the movements of European observers who are required by law to be present at the border.